Here is a new seat that I just released for sportsters (solid mnt. Evo engine bikes) all hand crafted in Salt Lake City. 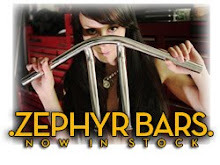 I have the new Zepher Bars back in stock. They are 3in shorter than the old version (8.5in vs 11.5in) offered in chrome and polished 1018 steel.